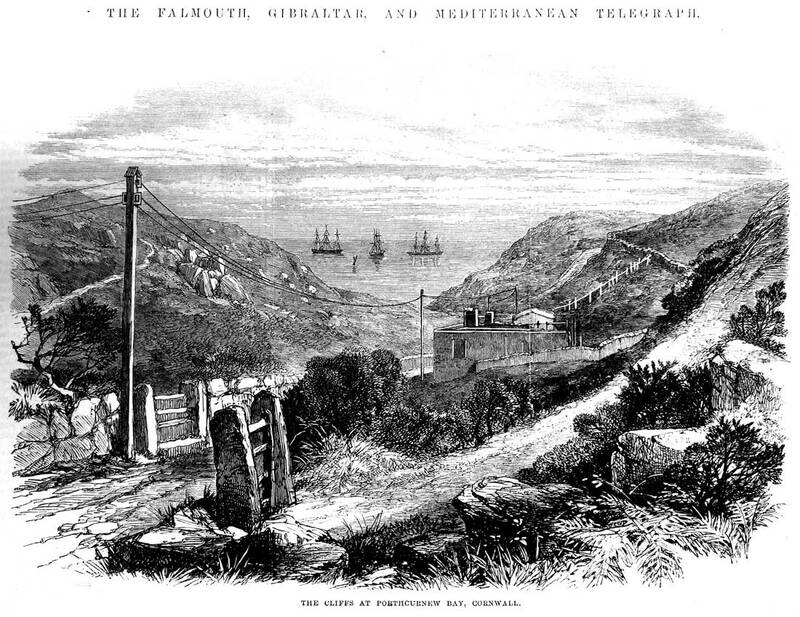 THE FALMOUTH, GIBRALTAR AND MALTA TELEGRAPH COMPANY (see also the main page on the Eastern Telegraph Company). John Pender’s second telegraph company, formed in 1869, was the Falmouth, Gibraltar and Malta Telegraph Company. Despite the name, the high risk of damage from ships’ anchors at the busy port of Falmouth changed Pender’s mind about the landing point, and the cable came ashore at Porthcurno instead. Telcon were awarded the contract for manufacture and laying; however they sub-contracted much of the cable manufacture to W.T. Henley, while carrying out the laying themselves. This started at Malta on 14 May 1870 with CS’s Hawk, Edinburgh and Scanderia laying the 1150 nm cable to Gibraltar. CS’s Scanderia and Investigator then laid the 366 nm cable from Gibraltar to Carcavelos, Portugal. 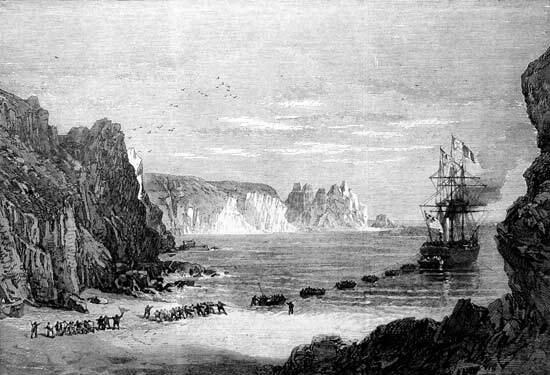 The last section, Carcavelos to Porthcurno, Cornwall, 824 nm long, was laid by CS Hibernia, starting from Carcavelos on 2 June 1870 and arriving at Porthcurno six days later. CS Investigator laid the shore ends of this the first cable into Porthcurno. See also the page on the Bombay - Aden - Suez section of the cable. THE FALMOUTH AND INDIA TELEGRAPH CABLE. The successful completion of the submarine telegraph line between Malta, Gibraltar, and Falmouth, in connection with the Anglo-Mediterranean and the British Indian submarine telegraphs, to form a direct submarine communication all the way from India to England, crossing only the land of Egypt, has been announced, to the public satisfaction. 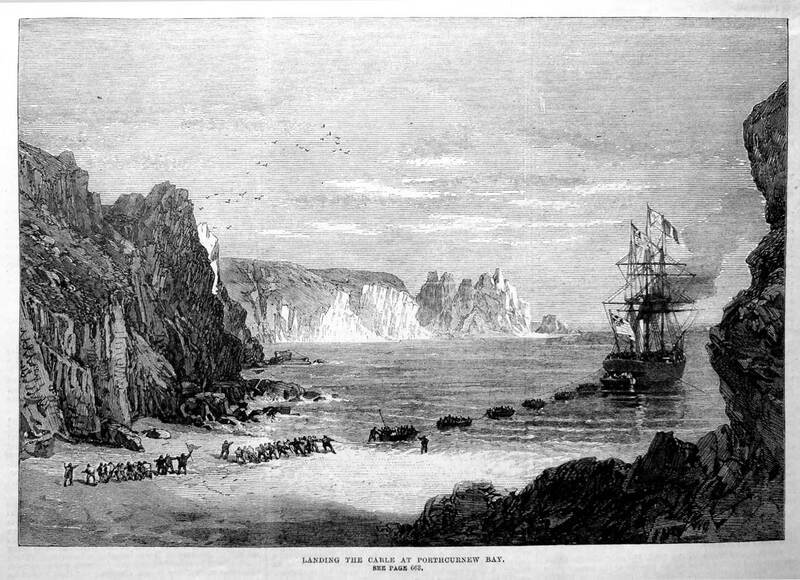 We gave an illustration of the rendezvous of the vessels engaged in laying the Malta and Gibraltar section of the cable off the Isle of Pantellaria; and we now present two views, from the sketches made by our Special Artist, of Porthcurnew Bay, on the coast of Cornwall, and the landing of the shore end of the Gibraltar and Falmouth section. Porthcurnew Bay is nine miles south-west of Penzance, and four or five miles south-east of the Land’s End, close to the famous Logan stone of Treryn Castle. It was the landing-place of the Mid-Channel telegraph cable, which communicates with the signal-ship Brisk, moored half way between the shores of Cornwall and Brittany, to give information of vessels entering or departing from the British Channel. There is here a picturesque gorge, or deep valley, declining abruptly towards the sea between the bluff hills, which are crested with granite boulders, or tors, and show their flanks covered with yellow gorse, just now in full blossom. The beach of the little bay, like the bottom of the deep Atlantic in mid-ocean, is composed chiefly of powdered shells. The promontory of Treryn Dinas, or Treryn Castle, as it is sometimes called, though no castle was ever built there, is seen in our view of the landing. Upon it stands the Logan Stone, a mass of granite weighing sixty-five tons, which was formerly so poised on its axis that it might easily be rocked. An ambitious young naval officer, Lieutenant Goldsmith, nephew to Oliver Goldsmith, once amused himself and exercised his mechanical skill, with the help of a boat’s crew of sailors, in removing this stone from its perch. The Lords of the Admiralty very properly censured him for this thoughtless act and compelled him to replace the stone at his own private cost. Treryn Dinas may have got its name of “Castle” from the resemblance of its broken mass of cliffs to the shape of a ruined pile of buildings. Its Celtic name signifies “The place of fight;” and it may have been here, if anywhere, that Brutus, the son of Aeneas, defeated the giants Gog and Magog, according to the old mythological history of Britain. The screw steam-ship in this little bay, from which the shore-end cable is being landed by means of the boats, is the Investigator. The Scanderia, with the Hibernia and the Edinburgh, had brought the main cable across the Bay of Biscay. These three vessels are shown lying in the bay, in our other engraving, which gives a view from the cliffs, looking down the valley to the sea. The shore end, heavy cable protected by metal strands woven round it, was joined, on shore, to a lighter cable, which was carried up to the huts built, on the hill above, for the telegraph clerks. This land cable was buried in a trench 18 in. or 2 ft. deep, cut through the earth and rock. 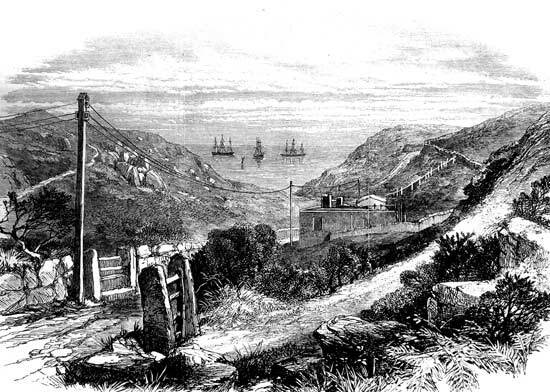 From the telegraph-huts at Porthcurnew, along the line to Penzance, over a wild and hilly country, is erected a range of telegraph-poles, carrying the single wire of the Mid-Channel Telegraph and the two wires of the Gibraltar and Falmouth Telegraph. We shall give some further illustrations of the subject and of the scenery of that remote part of Cornwall.